Line of Polity is the second in the Ian Cormac series by Neal Asher, which is sci-fi spy thriller, basically James Bond in space. A rogue scientist is experimenting with ancient alien technology far more advanced than that of the Polity, and his intention is to use that technology to make himself all-powerful. The outlink station Miranda has been destroyed by a fungus that appears to have been deployed by Dragon, a mysterious alien being. The refugees from Miranda are picked up by a ship from Masada, a world outside the Polity which is ruled by a theocracy and keeps most of its population as slave labour. There is a rebellion on Masada led by Lellan Stanton, the sister of John Stanton, an arms dealer. Because of Dragon’s involvement, Ian Cormac is sent to investigate. 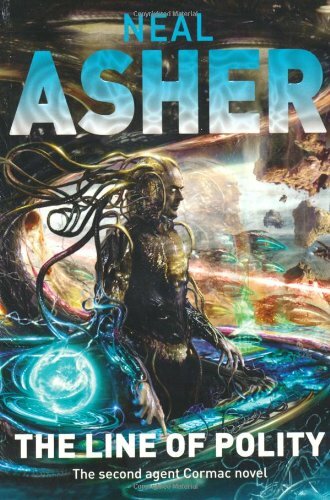 Describing this as James Bond in space is not doing it justice as Neal Asher’s books are much richer and more complex than Ian Fleming’s were. Cormac is a more rounded creation and the supporting characters are much more real as well. Gant is back. He was killed in the first book but it turns out he had himself backed up and so was downloaded into a golem body. Gant and Thorn were my favourite characters from the first book and I was happy to have Gant back. He spends a lot of time wondering whether he is still the same person as he was. When he is reunited with Thorn, who had not known Gant was backed up and so had grieved for the loss of his friend, there is some awkwardness in the relationship. The way Asher uses this relationship to explore what constitutes a person is really well handled and he portrays a deep, intimate friendship between these two men. I thoroughly enjoyed this. If you like space opera, particularly Iain M. Banks, then you’ll enjoy this. It’s exciting, entertaining and well written.